Service Costs > How Much Does a BJ Membership Cost? How Much Does a BJ Membership Cost? BJ’s Wholesale Club is a membership-only warehouse club chain, similar to Costco and Sam’s Club. How much does a BJ’s membership cost? BJ’s offers two membership options, similar to other wholesale clubs, and the cost is dependent upon which membership you choose. The Inner Circle card costs $50 a year, whereas the BJ’s Perks Rewards membership will cost $100 a year. These prices are often discounted, however, depending on the time of the year. Occasionally, you can find a membership for up to 50 percent off on Groupon.com, for example. The club offers two membership options: the Inner Circle membership or the BJ’s Perks Rewards card. The Inner Circle membership offers one primary membership card and a household card supplied at no extra cost. Up to three supplemental memberships can be purchased for the same household. A business membership includes one primary business card and one business free supplemental card, provided at no extra charge. Up to eight supplemental business cards can be bought. The BJ’s Perks Reward card offers the same perks as the Inner Circle card, but with every purchase made in the club and at BJs.com, you will receive 2 percent cash back. All members, according to the company, will enjoy up to 25 percent off grocery store prices, fresh choices, exclusive club brands, coupons, low gas prices and over 20 exclusive services. Members who apply for supplemental memberships beyond the first two members for a personal membership are required to pay $30 for each member. 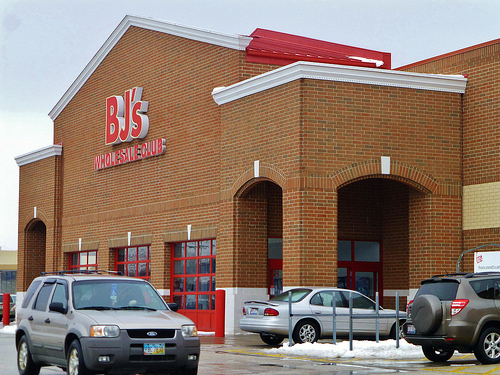 Up to three supplemental members are allowed for each BJ’s Wholesale Club member. BJ’s Wholesale Club does offer a One Day Shopping Pass for non-members. A 20% surcharge is applied, with the exception of alcohol, to purchases made by non-members. The warehouse club accepts a variety of payment methods, including Visa®, BJ’s Visa® Card, MasterCard® Card, American Express® and Discover® Network. The payment options are accepted both at BJ’s Warehouse Clubs and for online shopping at BJs.com. Cash, checks, debit cards and EBT are accepted in the club’s physical locations. BJ’s Warehouse Clubs accepts manufacturers’ coupons for goods bought in any of the club locations where the product is sold. The club may limit the number of coupons redeemed per item and per transaction, however. Consider upgrading your membership before the expiration date. The fee is $15 if upgraded three months prior to expiration, $25 if six months prior or $40 if nine months prior. Use BJ’s in-Club coupons as well as manufacturer’s coupons when making purchases. Go to the official website to see which BJ’s and manufacturer coupons are available for the month. BJ’s offers two credit card options that can offer up to 5 percent cash back on BJ’s purchases. If you plan on shopping online, consider using eBates.com to get cash back on your purchase.